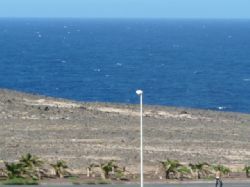 Nuevo Horizonte ,Costa de Antigua is situated some two minutes north of Caleta de Fuste, a purpose built holiday resort on the east coast of Fuerteventura, about fifteen minutes from the airport and twenty minutes from the island capital of Puerto del Rosario. 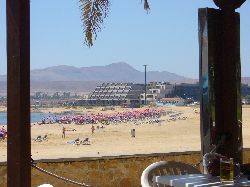 Costa de Antigua is a mainly residential area with a few hotels. 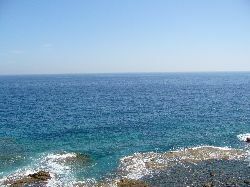 There are a number of restaurants and bars nearby although a wider choice can be found in the neighbouring Caleta de Fuste which has been developed in such a way that it can be enoyed by everyone who appreciates a safe, relaxing holiday in a friendly environment. Also in neaby Caleta can be found two 18 hole golf courses as well as the Atlantico shopping centre and several brand new 4 and 5 star hotels and complexes. 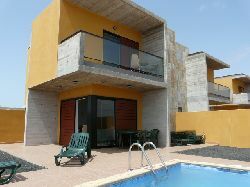 This brand new Villa, "las Claudias" is a modern design duplex semi-detached villa with four bedrooms, two bathrooms and toilet, A spacious lounge/dining area and seperate kitchen. The lounge boasts wide glass doors opening out on the garden, sun patio, private swimming pool and barbeque area. The master bedroom has ensuite bathroom and private balcony. There is also private covered parking for two cars. The all year round climate of Fuerteventura allows you to enjoy and spend most of your time outside which is why the living room has been designed with wide glass doors which integrate the garden giving a sensation of space.